for a table for one. After discovering a devastating secret about her marriage, Marcie's mother drags her daughter from their Idaho home to New Hampshire for what Marcie initially thinks is just the summer. But summer comes and goes and Marcie sees no signs of her mother returning to Idaho. Now she must start at a brand new school as she longs for home and the boyfriend she left behind, not to mention missing the mother who, while physically present, has seemingly abandoned her daughter to drown in her own grief. So not only is Marcie desperately homesick, but that yearning for her life back home is compounded by the fact that she must take care of herself and her mother. So when a handsome, popular boy starts paying attention to her at school, Marcie's loneliness forces her to question her already existing romantic relationship with her current boyfriend. 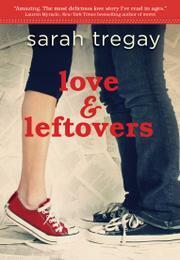 Love and Leftovers is Sarah Tregay's first foray into the YA world and oh boy did she begin on an ambitious note. Written entirely in verse, many might consider this an easier format in which to write, but they would be vastly incorrect. While a novel in verse is certainly easier on the reader, writing a whole novel as a poem means you must use such a precise economy of words. In poetry, one word has to do the work of five... or ten. I loved the fact that despite being such a quick read, the story still has depth and breadth. The plot moves along quickly and yet there's still time to contemplate a great deal of empathy for all of the characters, not just the main character. This is one of those novels where there's no true antagonist. There are lots of people who make poor decisions, but not necessarily a "bad guy" and "good guy." It's a complex and satisfying plot all done in about 1/3 of the words of a novel in prose. Lots of contradicting elements happening and yet it all still works. I hope this won't be Sarah Tregay's last novel in verse. I can definitely see this becoming her niche.